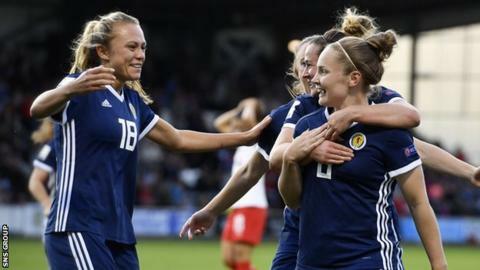 Scotland Women will play at Hampden Park for the first time in seven years as they take on Jamaica in their final warm-up for the World Cup. The match kicks off at 19:35 BST on 28 May, with head coach Shelley Kerr hoping to attract a record crowd. The target to beat is the 4,098, achieved last year against Switzerland. Scotland's opener at the finals in France comes against England on 9 June in Nice, with Japan and Argentina also in Group D.
Like the Scots, Jamaica will be making a World Cup debut and they will be in Group C, alongside Australia, Italy and Brazil. Kerr's side continue their preparations with games against Chile and Brazil in Spain in April. The last time Scotland's women played at the national stadium was in October 2012, when they drew 1-1 against Spain in the first leg of a Euro 2013 play-off. Kerr said the Hampden friendly "will be an incredibly exciting moment for everyone associated with the national team". "It gives some of the players a chance to play at the national stadium for the first time and will further aid preparation for the biggest test of their careers in France, where they will play in other impressive stadiums," she added. "We're hopeful that the country continues to get behind us and give the players the send-off they deserve at Hampden Park."